Dimitri Stavropoulos | Greek Lawyers – Stavropoulos L.C. Dimitri Stavropoulos is senior counsel and the firm’s chairman and managing partner. He was born in Montreal, Quebec, Canada on December 31st, 1955. He received his primary and secondary education in the multi-cultural environment of Quebec and at age 15 he was honored with early admittance to study Economics at Loyola in Montreal. Thereafter, he was accepted to attend the prestigious Athens University of Law in Athens Greece, from which he received an LLM Degree 5 years later. Recently, Dimitri was awarded his certificate of successful training in mediation in Civil and Commercial Matters from the Athenian Institute of Mediation in Civil and Commercial Disputes from the Athenian Institute of Mediation Training (AKKEΔ) . His recent legal work includes, drafting and preparing two concurrently executed co-venture agreements involving The People’s Republic of China in the areas of cruise liners and commercial fishing. He currently heads the legal department of a Greek Commercial Airline Company. Dimitri has also served in international trials as an expert witness in Greek Civil and Commercial Law in various jurisdictions of Courts in North America. 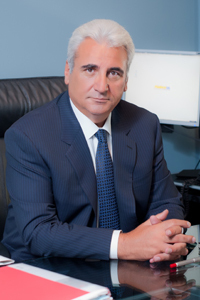 From his many years of devoted legal practice, Dimitri Stavropoulos has created a vast network of domestic and international partners & associates and professional affiliations, consequently achieving intrinsic collaborations in all aspects of the Law to better serve and protect his clients and their interests both nationally and internationally.